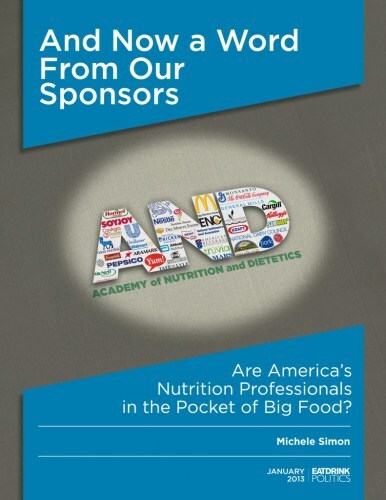 A new earth shattering report released by Michele Simon of Eat Drink Politics identifies some of our nations biggest food companies as sponsors of the Academy of Nutrition and Dietetics. The Academy is “the world’s largest organization of food and nutrition professionals.” Sponsors include ConAgra, General Mills, Kellogg, The National Dairy Council, and the academy’s most loyal sponsor of the past 12 years: the National Cattlemen’s Beef Association. The top level of corporate sponsorship enables access to nutrition professionals and teaching them how their company’s products can contribute to a healthy lifestyle. For example, registered dietitians can earn continuing education units from Coca-Cola, in which they learn that sugar is not harmful to children and aspartame is completely safe. Co-branding allowances are also included in some of the higher level sponsorships. For example– the National Dairy Council’s “3-Every-Day of Dairy Campaign.” The campaign is easily interpreted as a nutrition campaign especially since the AND logo is used without disclosing that the logo’s usage was paid for. Despite decisions of the Academy as a whole, not all member dietitians agree with the direction of the organization. In an independent study, 97% of RDs surveyed thought the Academy should verify that a sponsor’s corporate mission is consistent with that of the Academy prior to accepting them. On February 12, Dieticians for Professional Integrity was launched by a group of dietitians who advocate for more ethical practices and more relevant corporate sponsorships. The organization grew to 500 within the first two days. These links and partnerships are pleading for Americans to be conscious of who is supplying the vital health information that we’re relying on. With big businesses today often behind many of America’s institutions, it’s becoming harder and harder to blindly trust information that years ago we may have seen as objective.